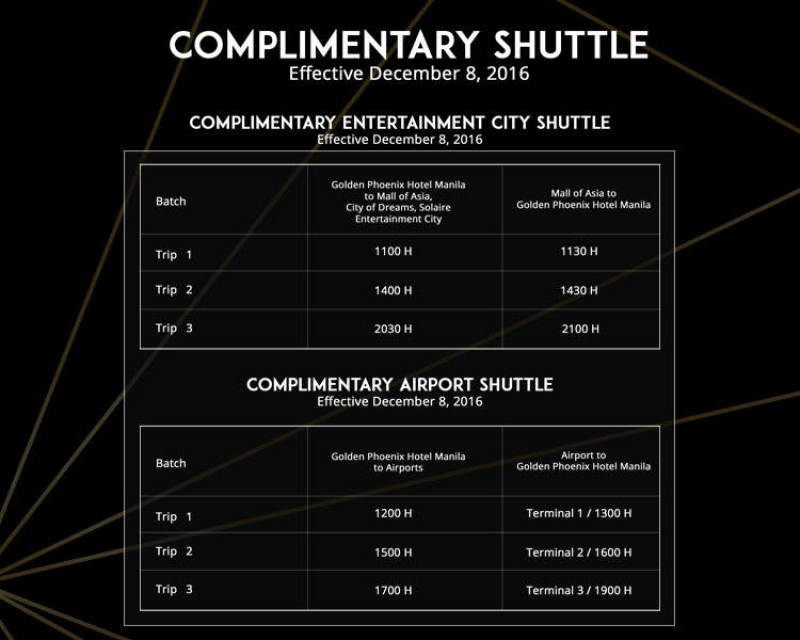 Click here to check out other promotions by Golden Phoenix Hotel Manila. 1. The shuttle service is provided every day, See schedule. 2. This service is provided for registered hotel guests only. 3. Prior reservation is required. This guarantee may be suspended, in the interest of safety, during certain weather conditions and other situations where safety may be compromised. 4. Golden Phoenix Hotel Manila will only allow one (1) carry-on per person for all pickups. Golden Phoenix Hotel Manila will not accept any baggage beyond these limits, unless from arrangements had been made. 5. Golden Phoenix Hotel Manila cannot guarantee traffic conditions or travel time, and should there be a delay of any kind, the hotel is under no obligations to compensate for any amount spent on the taxi fares or other means of transportation. 6. In extreme circumstances and peak periods, Golden Phoenix Hotel Manila shuttle service reserves the right to replace their van with other forms of vehicle such as Sedan, etc. that will not necessarily be in traditional shuttle service. 7. The van will leave the hotel entrance promptly according to the schedule, however pickup times from the shopping location may vary according to traffic conditions. 8. Space available on a first com first served basis. 9. Golden Phoenix Hotel Manila will not be liable for lost baggage since, baggage is never removed from the passenger’s presence. 10. Golden Phoenix Hotel Manila is not liable in the event of mechanical breakdown while on charter and will only be responsible for making up lost time at a mutually agreed date. 11. Smoking is not permitted in any of our vehicles. 12. Golden Phoenix Hotel Manila is not responsible for articles left in the vehicles. 13. Vehicles cannot be loaded beyond seating capacity.